This week, I have received my instructions to vote. Twice. The election in question does not take case in some banana republic, of course. But in two different countries, one day apart: On October 18, the Swiss elect their next national parliament. And on the following day, Canadians do the same. Not only are the two forms of democracy different, but the rules of the game are, too, as the documentation in my mailbox illustrated. The packet from Switzerland included a leaflet that said in bold letters No e-voting. Turns out that the Federal Council has rejected the electronic vote system that a coalition of cantons had been planning to use. Thus, it was back to paper for everyone, including citizens voting from abroad. At least, this time around I was able to receive and return my ballots by mail in time. Four years ago, the paperwork sat unused in Montréal while I was in Chile. The Swiss system works on proportional representation, and elects both a lower and an upper house of parliament (hear that, Canada?) In each canton, a panoply of parties, both established and less so, compete for votes. The two newly elected chambers then pick the 7 federal ministers who form the executive branch, distributing seats roughly according to the share of votes each party got. A compromise-bound coalition ensues. Each citizen has as many votes as there are seats to give out in his canton, either by simply picking the list prepared by the preferred party or by randomly assembling candidates from across all parties. The Swiss can even double their vote for the same individual. The system offers so many twists, it would not be out of place in a game show. More straightforward, e-voting glitch aside, is how a citizen casts his vote. 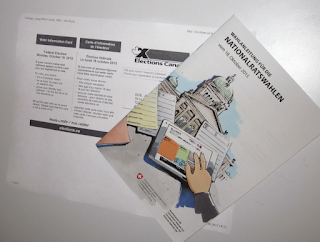 From birth, every Swiss citizen and his current residence are on file with the civil registry office. To this address, both the privileges (voting documents) and duties (tax forms, military marching orders) are being mailed. And the Swiss are perfectly aware and comfortable with continuously updating their records as they move around the globe. One of the first things I did after my arrival in Canada was to register with the Swiss consulate in Montréal. And ever since, I have received my ballot papers for elections and referendums in the mail. Like the vast majority of Swiss residing in the home country, I cast my vote by return mail - all I have to do is fill in the ballots and sign a card. (Since I live abroad, I also have to stump up for postage in the absence of e-voting.) Signed, sealed, elected. Compare this to the Great White North. “I can’t travel to see the client on the 19th”, said my boss. “It’s the election.” I looked confused. Would planes not fly on that Monday? Would there be a curfew and police roaming the streets? Should a Canadian have moved since the last election, the responsible government body will not have been advised of this fact by the tax agency or the local municipality. Instead, it is up to prospective voters to re-register in their new district. And to prove that he is indeed an eligible citizen. So while the process to cast a Canadian vote may be more cumbersome, the actual choice is dead simple. In each riding, there is precisely one candidate to elect, from a choice of 4 or 5: Each major party will present one contestant. In picking a person, you vote for the individual, the party’s platform and also for a prime minister, as it is understood that the leader of the party with the most elected candidates nationwide will become the next head of government. If you like your local MP but not his party leader… well, too bad. I have learned all this despite not being allowed to play the game: Since Elections Canada has no idea where registered voters live, they send their documentation to everyone in Canada. And what about Canucks outside Canada? A controversial law was recently upheld on appeal, limiting voting rights to Canadians living abroad for less than 5 years and having an intent to return to reside in Canada. Everybody else has no say. If Switzerland applied the same rules, I’d be completely without a voice in this fall’s political season. As it stands, I can vote for the clowns providing the next four years of entertainment in Berne, but not for the gang running the show in Ottawa. Is it more likely that by 2019, I will be allowed to show up at the polling station in Canada, or to vote electronically for Switzerland? With these odds, perhaps I'll just go play the lottery instead.